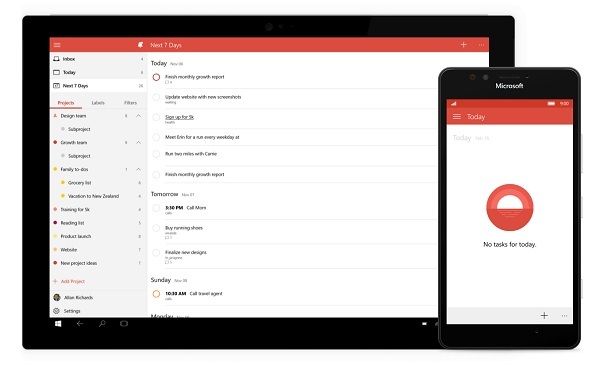 Todoist launches Windows 10 app. Last November, Todoist released very first Preview version of Todoist for Windows 10. Today Todoist announced that the official Todoist for Windows 10 app is now freely available to everyone on the Windows Store for the very first time. Get organized and start moving your important projects forward with Todoist on all your Windows devices. As a universal app, Todoist for Windows 10 adapts beautifully to any screen size. That means you can manage your tasks on your PC, laptop, tablet, and even your Windows Phone! Get a big-picture overview of your projects in full-screen mode, or stay focused with just your Today list on the side of your screen for easy reference throughout the day. Manage your tasks anywhere, anytime, on any device. Get the peace of mind that comes with knowing your to-do lists are everywhere you need them. Since first Preview version, its Windows team has worked hard to make Todoist easy-to-use and fully accessible on all your devices - online and offline. And while you're moving from one Windows 10 device to the next, all task comments you draft will be automatically saved and synced across each one. That means you can start writing a task comment on your Windows phone and finish it on your Surface. Or vice versa. You'll never have to worry about losing a comment you haven't quite finished yet. Todoist works perfectly on your Windows devices even when you’re offline! Any changes you make will automatically sync across all your devices as soon as you re-connect. Now you can enjoy seamless touch gestures on all your devices. Todoist's Windows team revamped a few key interactions - including the way you add tasks and reorder lists with drag-and-drop - to work beautifully whether you're using your keyboard or your screen. Not only is Todoist for Windows 10 everywhere, it's also faster than ever. Get your to-dos out of your head and into Todoist the moment they come to you with our intelligent Quick Add. This crafty little feature lets you add tasks and all of their associated information in a single line. Intelligent Quick Add is a powerful way to spend less time managing your tasks and more time actually getting things done. And it's now available on every Windows 10 device in 10+ languages. 3rd-panel view allows you to view your comments and task lists at the same time so you always have context for your conversations. Customizable Live Tiles keep you focused and organized with a quick overview of the number of tasks you have left for today and your next upcoming task. Jump List integration lets you pin your most important task views to the Start Menu or Taskbar for easy access throughout the workday. Todoist Karma - Todoist will be adding Todoist's popular productivity tracker soon, complete with beautiful charts to visualize and improve your productivity week over week. Cortana integration - We plan to integrate even more deeply with all of the unique features Windows 10 has to offer, starting with the ability to dictate your tasks via Cortana. Filters and task history - Todoist completely rebuilding the way we handle completed task history and filters to make them consistent across all of Todoist's platforms. That's why you won't see these features in the Windows 10 app quite yet. Todoist will add task history and filters to Todoist for Windows 10 the moment they're ready.